February, one of my favourite months! 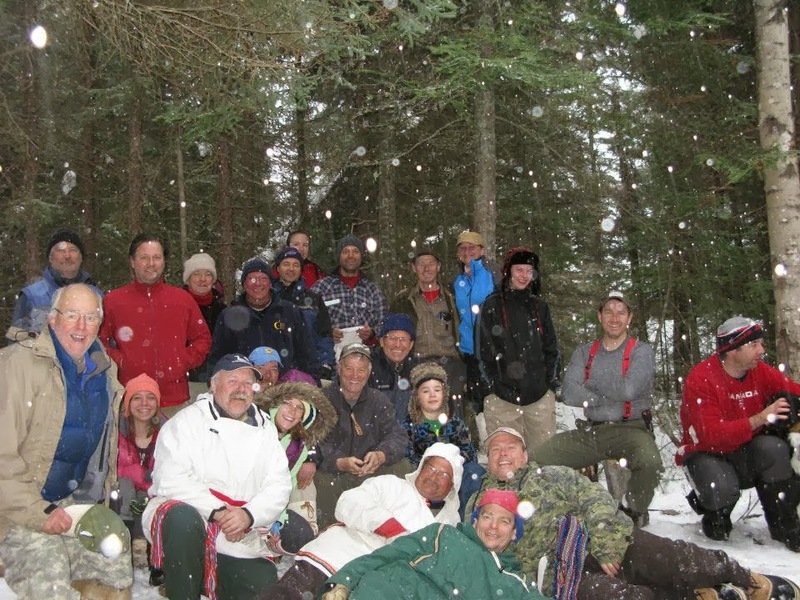 I get to join a bunch of like-minded folks for an annual 9 day winter camping trip somewhere north of Sudbury, Ontario. This year was the 13th annual "Deep Freeze" trip. In the past we have mainly used the Via Rail "Budd Car" service out of Sudbury to access a camping area but it was decided to look for a new area this year, one that was accessible by vehicle. The Budd Car has become increasingly unreliable over the years, mostly due to aging equipment that can't take the cold weather abuse. Last year the train missed running on Tue/Wed of the week we were out and consequently some folks had to hike 12-13 km down the tracks to a road access where they could be picked up as they needed to be elsewhere other than stranded in the bush! Anyway, planning began in the late summer/fall and centred on an area we had used in 2011 when the train didn't run at all for the week. 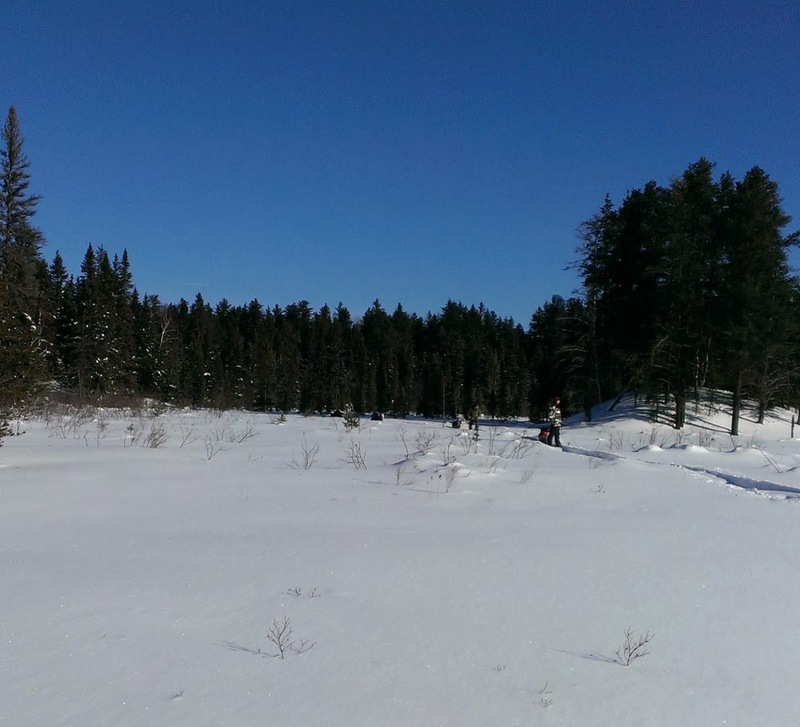 We had headed north of Sudbury up Hwy 144 and then trekked off the hwy about 3 km though the bush across Sideburn Lk and into Smokefox Lake to set up. Not everyone who planned on the trip came with us, about 10 of the group decided to go to Killarney PP instead of heading into the unknown area. This year we scouted out the area in the fall by hiking and canoeing into the location we were interested in. This group of winter enthusiasts started out 8 strong but over the years has seen as many as 44 attendees and has settled into the 30 - 40 range yearly. A group this large needs 3 things for a successful trip - parking for upwards of 10-15 vehicles, a large enough area for 10-12 hot tents and a few cold tents plus a ready supply of firewood! Parking in the bush in winter is always a problem as roads are not plowed and gravel pits, lake access points etc are unavailable. Fortunately the area we wanted to access has a gravel pit along the highway that the local trapper keeps plowed for access to his trap line and cabin, 1 necessity taken care of! In 2011 we trekked into Smokefox Lk and while we managed, camping spots for large tents and the firewood supply were a bit of a problem. On one of our hikes we had crossed into Sideburn Lk and a couple of us had noted a supply of standing dead trees on the north end of the lake and had put the info into storage in our brains as a possibility someday. Well, we scouted the area in the fall and the wood was there but again not a piece of flat ground for tents to be found in close proximity to the wood supply! Further down the lake was a piece of shoreline that looked like a bench and had plenty of room for any number of tents but a very limited supply of firewood. However, there was a couple trees available that would get us through the first night till we could move some wood from down the lake - about 900 - 1000 metres away. All in all it was a doable situation all be it with some work but it was decided that Sideburn Lake would be the location for the week. 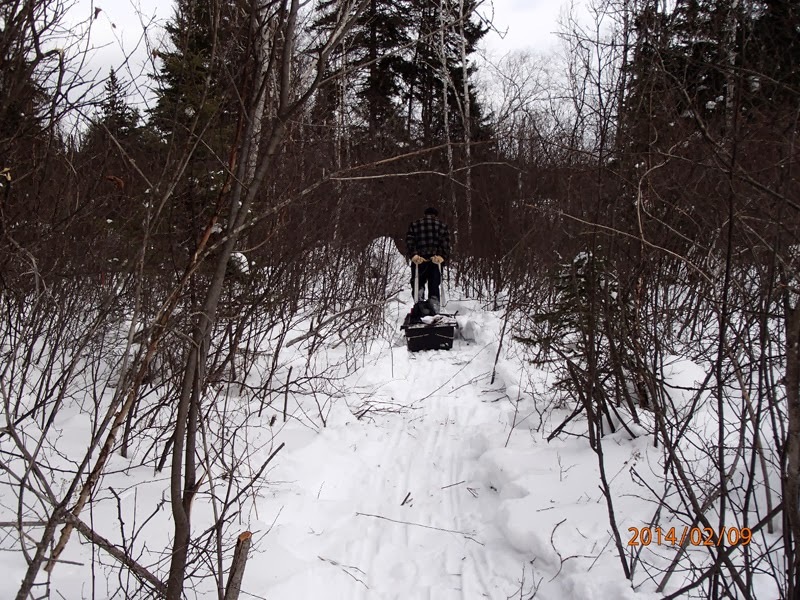 Joe and I went out to check the gravel pit parking area and to set a trail into the lake the weekend before the camp. 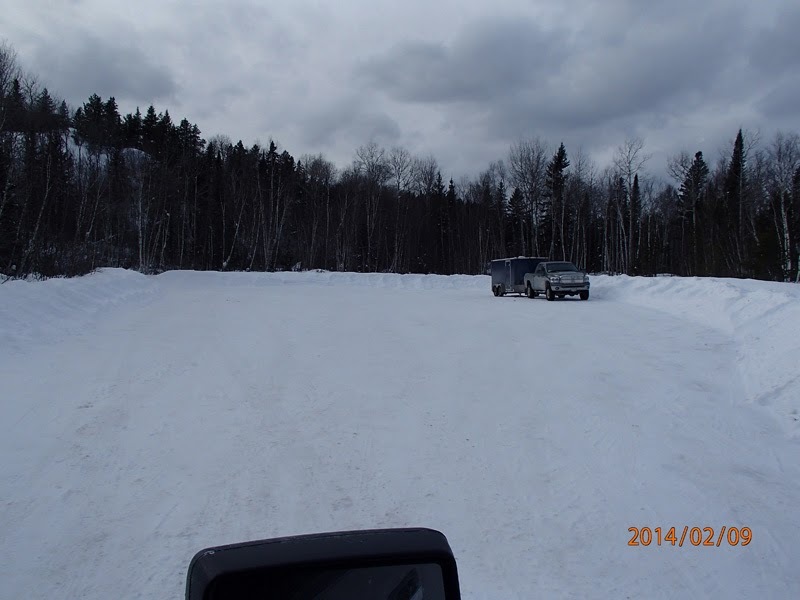 The pit was plowed with room enough for all and we established a safe area to unload vehicles and load toboggans up the highway a kilometre or so from the pit parking area. We set the trail and brushed out the trail through a swale we cut through along the way. Things were set and folks notified of the trail head location and I spent the next week organizing my food, equipment and packing! Well, Saturday dawned clear and cold with a bit of wind but then it has been that kind of winter - an old fashioned cold winter with a lot of snow! The put in is about an hour north of Sudbury and I was the first to arrive at around 9:00 am and was greeted by a colorful sundog hanging in the sky. The other folks started to filter in and the arrivals continued all morning long. The first group of 6 were on the trail by 10:00 am and we pulled into the camp location about an hour later. Folks continued to arrive throughout the early afternoon and by suppertime the population of Sideburn Lk. had grown to 29 people and 2 dogs! 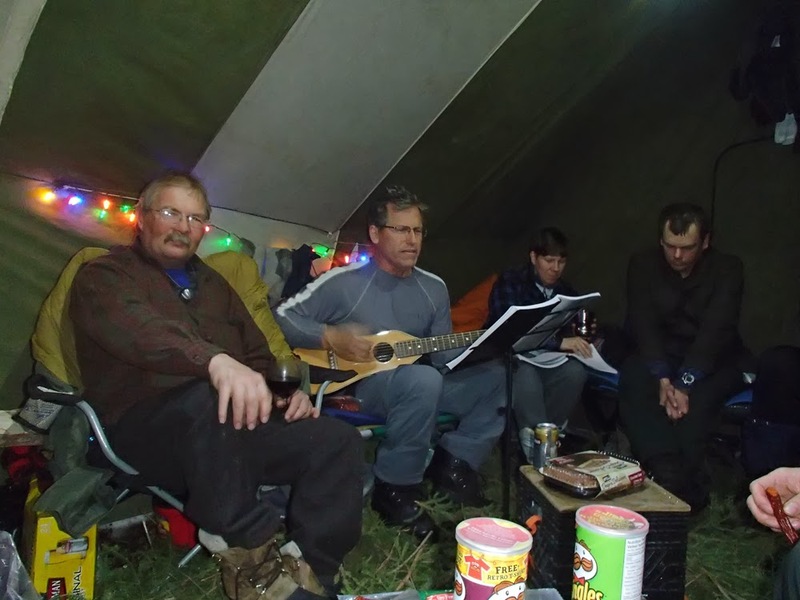 We set up camp which included 9 hot tent and 2 cold tent setups spread around the area. 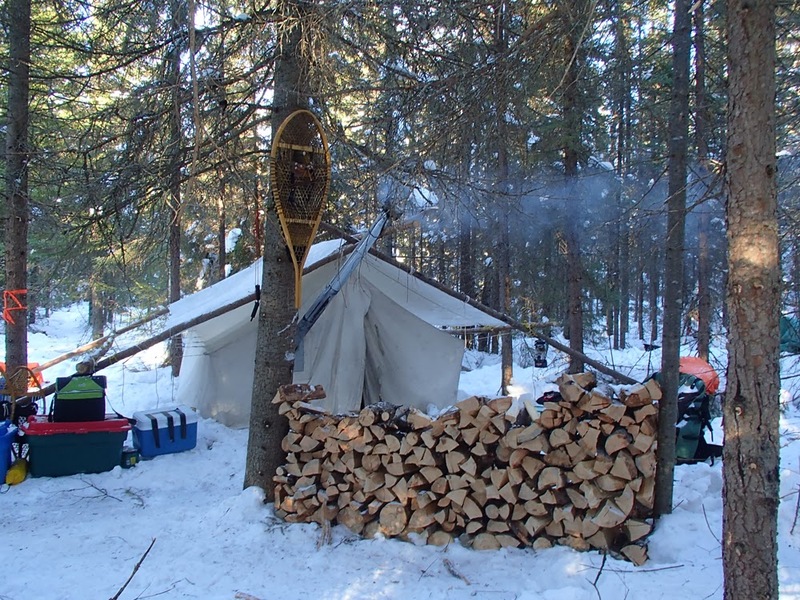 Once set up was completed, a couple of dead trees were felled and firewood for the evening was split and piled at each hot tent and a communal water hole was established. Jim and his family came in on 2 Skidoos which promised to make the collection of firewood down the lake much easier than first anticipated on Sunday! Sunday arrived with a clear sky and cold temps to start the day! Once folks had finished breakfast and chores a wood detail was established.Four of us headed down the lake cutting dead trees as we worked our way down to the area with the bulk of the dead trees and Jim and his wife Nadine took turns pulling sled loads of wood back to a central area at camp. Here the rest of the folks kept busy splitting, delivering and stacking sled loads of wood at each hot tent site. Four hours work gave us enough wood to last till late in the week. 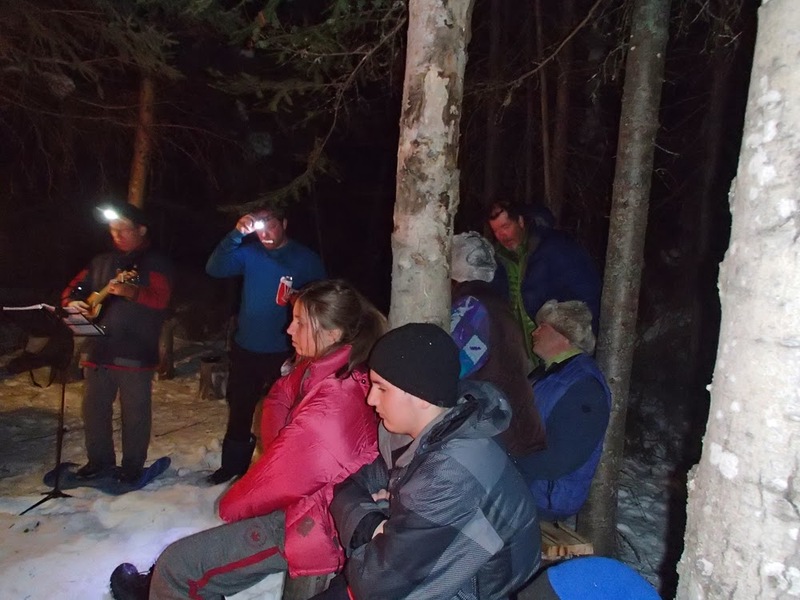 Turned out that Sunday night was to be our coldest night in camp as well at -29 Celcius! Gotta love whoever invented the Styrofoam we use on our "thunderboxes"! 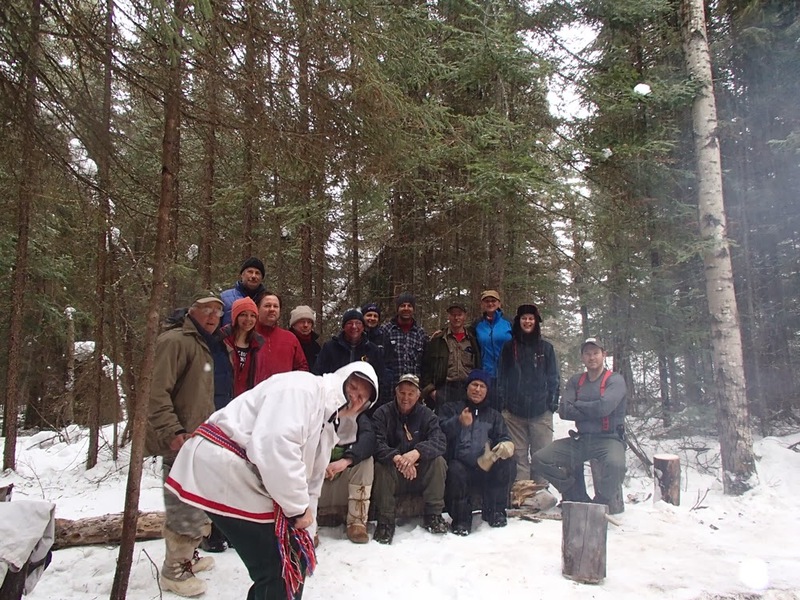 Camp quickly settled into the normal deep freeze routine - lots of snowshoe hiking, ice fishing (or wishing) daily chores and socializing. Since this camp was road accessible we had folks both coming and going according to their own schedules etc. One cold tenter left on Monday and Moe and Kevin, 2 long time attendees, arrived with Moe's hot tent plus another cold tenter skied into camp! A few folks left on Wednesday but a couple more showed up to replace them, it's always a relaxed atmosphere with folks coming and going as their schedule dictates. This year we had 35 attendees over the course of the week. Every year we usually have some sort of party during the week and it has evolved into a pot luck dinner one evening. 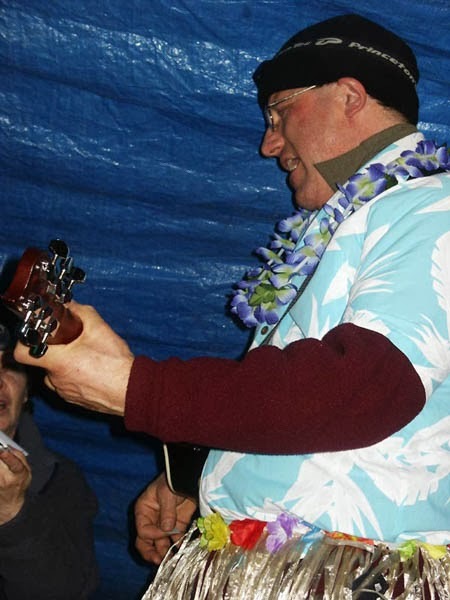 In 2005 another tradition started when Al brought his guitar for Hawaiian Night in sub zero temps! A memorable night in 2005 on Nitro Creek! Thursday night was to be the night and Al pulled into camp on Wednesday guitar in hand.Many of the folks would be leaving on Friday so another wood detail was organized and enough wood to see the remaining campers through to Sunday was gathered and delivered - gotta love them skidoos, saved us from hand dragging wood a kilometre to camp! A common area for the potluck and bonfire was prepared along with enough wood for a bonfire to sit around while Al entertained us with his vast repertoire of songs. Al is willing to play in almost any conditions and fortunately Thursday was one of our mildest days so his hands didn't get too frozen! Many of the group were packing and getting ready for heading home on Friday morning so we took a bit of time to take a group photo of the folks that were in camp at the time. After packing and saying good byes all around that left 12 of us in camp till Sunday. Chores, hiking and fishing ruled our remaining days and on Saturday night Al again played. He put on his "indoor" concert live from "Smokey's Lounge" for the remaining folks in camp. A more intimate and much "warmer" experience for all! One unique thing this year was listening to the Olympic hockey games on a small radio. It certainly gave ua different slant on the games listening to them rather watching on the TV. You could hear Al whooping and hollering across the whole camp every time the women's hockey team scored on the way to their thrilling comeback to win the Gold! A couple of us are actually old enough to remember listening to Foster Hewitt broadcast hockey on the radio many years ago. We packed up Sunday and headed for the road where Joe's wife, Carol met us and shuttled us to the pit to retrieve our vehicles. Once packed and goodbyes had been said, we were all on the road home with another great winter camp finished with some of the finest folks around!